Given the busyness of life today, many of us struggle to find the time let alone the energy, to prepare and eat a healthy meal three times a day, every day of the week. And you know what, I don’t blame you – especially if you have a family to cook for too. Make a plan of what you want to eat – Make a list of your favourite foods, then find recipes which are not only simple, but which can be made quickly or in bulk. You will also need to decide on what you are going to eat for snacks between meals. Simply write down 7 healthy breakfast, lunch, dinner and snack ideas right now, and you already have your first week done. Then do the same thing again for next week. Once you have a few weekly menus worked out, then you can rotate them to keep things interesting. Know what you need to buy – Once you have worked out what you want to eat, then write or even type out all of the ingredients into a shopping list which you can re-use each week. This way, you won’t waste time doing multiple trips to the supermarket each week. It will also mean that you are less likely to buy things which you don’t really need – including junk foods! This not only means you won’t have to use your willpower to avoid eating junk when it’s in your pantry, but it also cuts down on waste. Dedicate specific time towards meal prep – Ensure to dedicate specific time to prepare some of your meals ahead of time. This could be one evening during the week, a Sunday afternoon, or whatever time works for you. You can do this weekly, fortnightly or even monthly. I like to do a combination of all of these. Use your freezer – The best thing about using the freezer is that you can often cook in larger quantities and less frequently too. We do this with soups, casseroles (e.g. apricot chicken) and bolognaise sauce (which we serve with pasta or make lasagne). 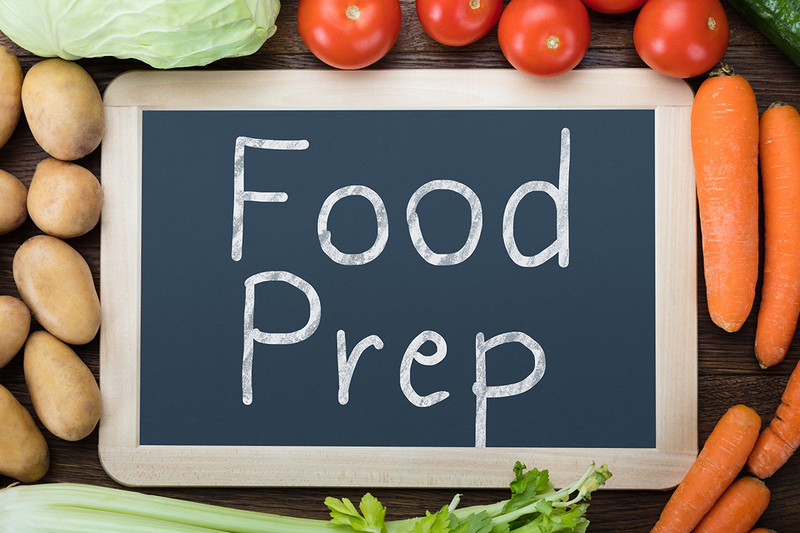 Prep wise: chop up ingredients that are suitable for freezing into appropriate portion sizes and freeze until required. We buy fresh seafood (Australian salmon, calamari, prawns and fish), chop it up, mix and portion it out into bags for marinara mix which we use for pasta, pizza, risotto, paella and on the BBQ. We have a whole second freezer dedicated towards meal prepped foods. Meal prep what is in season – Eating what’s in season is not only better for you, but it’s often cheaper too. For example, we like to chargrill and pickle capsicums and eggplants – if we do this in bulk when they are in season it costs us about $30 for 10kg. Out of season the same amount would cost us up to $130. Also if you grow your own and have lots of produce ready all at once, then this is great opportunity to meal prep for future use and reduce waste. Use left-overs for lunch – Where possible, cook extra for dinner and use left-overs for lunch the next day. This eliminates the need to worry about what to have for lunch most days of the week which is a huge time saver. Or if you prefer, instead of having dinner left overs for lunch, you can also use them to prepare a different meal the next day. For example, the day after having a roast, we either use the left over veggies to make pasties the next night, or the chicken in fried rice. The ideas are endless. Jump on the juicing bandwagon – If you’re short on eating fruit and veggies, then juicing may be for you. The secret here is to juice more veggies as opposed to just fruit, which can be high in sugar. If you are trying to lose weight then substituting one meal for a juice is fine, otherwise use juicing as a healthy snack. Plan out what combos you like and prepare the fruit and veggies in advance so all you have to do is blitz it. You can get an excellent blender these days for less than $200 that will turn just about anything into juice. Food prep for your gut too – We all know the importance of maintaining gut health when it comes to being healthy, so ensure that you prepare meals that feed your gut too. Fermented foods are best for this. Our staples are Kefir (2min prep time for next day supply) and Kombucha (15min prep time for 2 week supply), but it doesn’t matter what you choose – yoghurt, sauerkraut, or anything else, as long as you’re maintaining healthy gut bacteria. Keep snacks simple – When thinking snacks, choose things that are simple, easy to prepare, and nutritious. Fresh fruit, a shake, hard-boiled eggs, a tub of yoghurt and pre-cut veggies with prepared hummus are all great choices. Look for shortcuts – If you’re really pressed for time, then look for shortcuts such as buying pre-cut veggies and fruits, or pre-cooked meats like roast chicken. Canned foods are quick too, such as tuna or beans, which can be used to make lots of things. Have the right equipment – If you are going to be cooking on mass, then you need to make sure that you have the right equipment. Things like large stockpots and frying pans, maybe a slow cooker if you like using those will all make it easier for you to do this. Having a good set of knives, and so on will ensure that you can prepare meals more efficiently too. You usually get what you pay for, so buy the best you can afford. Invest in food storage containers – If you don’t already have them, then ensure to invest in some quality food storage containers of various sizes to suit your needs, as this will make a world of difference. Try to use glass, otherwise if using plastic, make sure it’s BPA-free and ensure it won’t melt in the microwave or dishwasher. However, no plastic is really safe. For easy storage, choose one container type and buy several that stack and store neatly. At the end of the day, meal prep is done to not only make your life easier, but to maintain health through sound nutrition. By making a small investment in time to pre-prepare your meals, you will have more time to focus on all of the other things required to live a happier, healthier fitter life. So tell me, do you meal prep and if so what works for you?